I held off on reviewing the last two weeks of Injustice because the last three issues tell one extended story. And what a story! While I may quibble with some of his individual character portrayals, I can't deny that Tom Taylor has all eight-cylinders blazing as he drives this comic forward. The plot shifts between two main focus points - a conversation between Superman and Batman where they argue the ethics of Superman killing The Joker and a confrontation between the rest of Justice League and Aquaman, as the King of Atlantis responds to the slaughter of numerous whales by poachers with extreme prejudice. 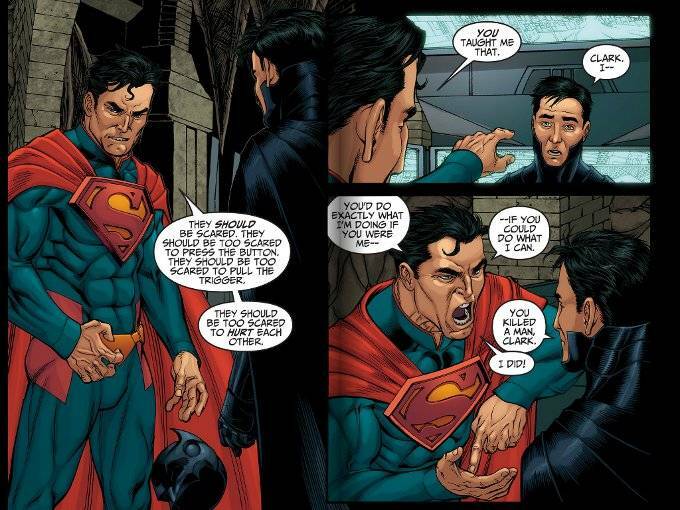 There are some great speeches here, such as Superman telling Batman that he's using the same methods Batman always has and Batman admitting that's true but insisting that Superman has to be better than that. 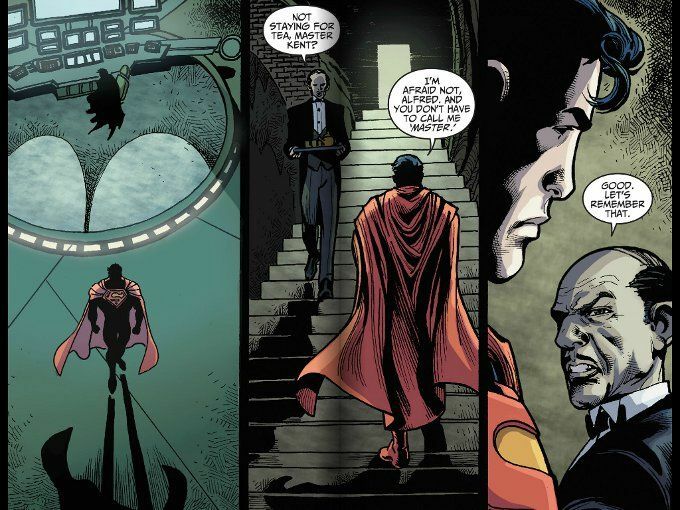 Yet my favorite moment is Alfred Pennyworth's short, quick and polite while still being pointed response to Superman's actions. That alone shows how much things have changed - even more than the conversation between Superman and Batman that effectively ends the World's Finest partnership forever. The storyline with Aquaman is more problematic. I've never been a fan on the take of Aquaman where he's portrayed as a second-string Sub-Mariner, always posturing against the evils of the surface world. Yet Taylor makes it work here, primarily through an eleventh hour scene in which we see the man behind the crown and how the duties of kingship conflict with Arthur Curry's wishes as a friend. I also have to credit Taylor with being one of the few writers to take advantage of just how scary an enraged Aquaman could be on a global scale. He's not much in a one-on-one fight but when you think about how many amphibious sea creatures there are and how big they might grow... well, giant crabs lining-up under the Golden Gate Bridge are an effective deterrent. I'm somewhat wary about the final page in which Wonder Woman, who many comic fans consider the embodiment of Truth, tells a bold-faced lie. While I'm willing to accept this is another world and that things are changing, this change seems a bit unlikely given what we've seen of Diana thus far. Still, it's no less unlikely than Superman killing and I think Taylor has under enough goodwill by this point for me to see where he's going with this. Mike S. Miller, whose work we've seen in several issues of Injustice before, handles most of the art duties here, penciling and inking Issues #10 and 12. His style is crisp and clear, with the figures clearly defined and outlined. His characters do look overly posed at times but not distractingly so. Tom Derenick draws and inks issue #11 with a more shadowy, atmospheric aura that I find suits the story well, particularly in the Batcave scenes. Bottom Line: This is a fine trio of web comics. If you're getting anxious for the release of Injustice: Gods Among Us in two weeks, these books should satisfy your action craving for a time.